Synchronization availability with enterprise information system, operative tracking of all spare parts in warehouse, including used and re-used parts. 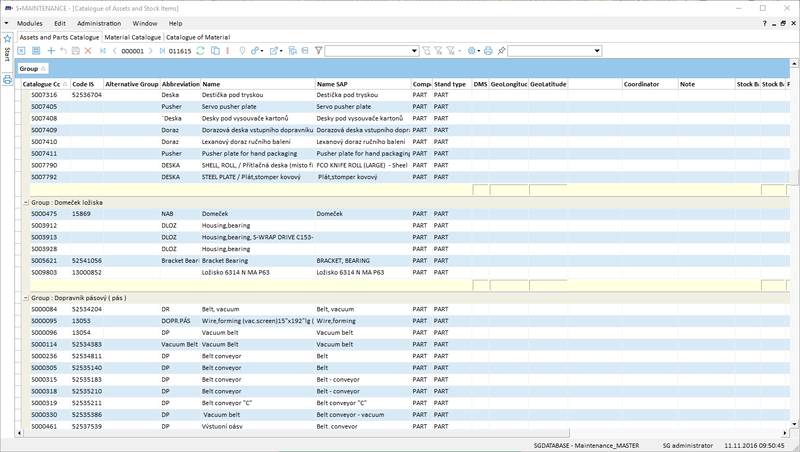 Inventory management system is integrated into regular maintenance activities, there are no separate warehouse documents (e. g. receipts), but only activities configured as stock movements. Along with the statement of work is subtracted state recognized item from inventory. Not only work is reported, all stock movements are counted, too. The general definition of stock movements as maintenance activities allows to record the movements of the return spare parts, parts to be repaired and accounting status of spare parts consumption. Spare part consumption is assigned to the items, machines, and their sub-items in the structure. Maintenance tasks are scheduled in connection with required material, spare parts, lubricants and other important items. The system provides the latest information about the spare parts availability, allows to track the spare part location, serial numbers, batch and so on. If necessary, the system can be connected to the storage module of client enterprise system. Currently there are connections via MS Excel® and XML (connection to SAP) or directly to the customer’s ERP database (e. g. Helios Orange, Helios Green, ESO9). The system allows on the base of reporting to generate material requisitions directly to ERP system with the information about cost center and about the exact point of consumption in the machine. The functionality of the module is based on the real needs of the maintenance workers, ensures minimal values of the spare parts in warehouse and records spare parts values from various suppliers. The system does not force to duplicate inventory database with high effort to maintain it.